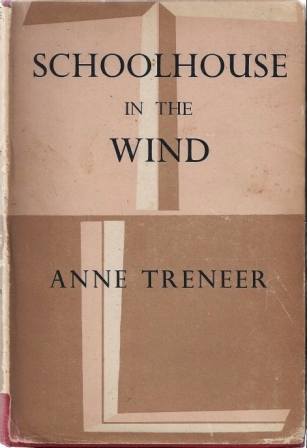 Schoolhouse in the Wind by Anne Treneer ~ 1944. This edition: The Travellers’ Library, 1950. Hardcover. 221 pages. A slight memoir which leapt into my hand as I was quickly browsing the back room bookshelves housing the “collectibles” during a recent visit to Hope’s lovely used book store, Pages. I’d never heard of Anne Treneer before, but I am so pleased to have made her unexpected acquaintance. Intrigued initially by the title, and wondering rather why this volume had been shelved among the back room “treasures”, I had no idea what to expect, but a brief dipping-into let me know that this was one of those personal memoirs of childhood which can be such appealing reading, capturing as they do the very essence of an individual’s earliest memories, and frequently memorable glimpses of long-passed time and much-changed place. Gasped and drew him in. Anne’s father was the local schoolmaster, and Schoolhouse in the Wind is an affectionate, humorous and occasionally poignant evocation of a small corner of Cornwall at the juncture of the 19th and 20th centuries. Gorran School, with a house for ‘master’ glued to it, stood strong and symmetrical, without beauty but not mean, triumphantly facing the wrong way. It might have looked south over the distant Gruda and the sea; but this advantage was forgone in favour of presenting a good face to the road. Master’s room in school, the big room as we called it, caught the north wind while the closets at the back caught the sun. I have heard that Mr. Silvanus Trevail, the architect, who designed many Cornish schools, committed suicide in the end; but whether out of remorse for his cold frontages I do not know. That last comment at the end of the book’s first paragraph filled me with quiet glee – obviously this was not to be a completely sweetly sentimental memoir, but something with a bit more bite! – and I read on with high expectations. Those expectations were well met and frequently exceeded. I could go on and quote many excerpts of Anne Treneer’s rather delicious writing, but I won’t. This book was recently (well, in the late 1990s, “recent” in the used book world, I feel) reissued along with its two companion memoirs, Cornish Years and A Stranger in the Midlands, as a one-volume trilogy. It should be fairly readily available in libraries – at least in British ones – and there are a number of copies available through ABE. I recommend it on the strength of this first volume of the trilogy, and I will be buying the combined memoirs for my personal library. The first chapter of Schoolhouse in the Wind sets the stage, as it were, introducing the physical setting of the chapters of reminiscence to follow, and though it will perhaps be of greatest interest to those familiar with the area, even to me, a reader who has never visited England, the picture it draws is vivid and memorable. Also vivid are the character portraits the author paints of her family; with a few well chosen words they come alive on the page. An internet search brought up a very few references to Treneer. Though she is described as a “prolific” writer, there appear to be few of her titles now available, aside from Schoolhouse in the Wind and the other two memoirs. Schoolhouse is also full of brief snippets of poetry; one assumes these are samples of the author’s work. Some are quite lovely; others seemingly aimed at perhaps a juvenile audience, which is understandable as Anne Treneer spent many years as a schoolteacher. 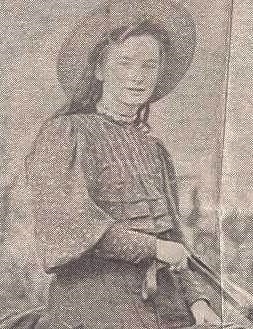 Anne Treneer never married, and seems to have led a happy and rather individualistic single life, pursuing her many interests with passion and good humour. She died in 1966. I will leave the subject of Anne Treneer, at least for now, with this excerpt of a short biography from Maurice Smelt’s 2006 book, 101 Cornish lives. Anne Treneer pulled off a difficult trick; she wrote an autobiography that succeeds in enthralling despite its almost relentless happiness. Most writers would not even try, reminding themselves that ‘happiness writes white’. It came out as three books over a period of eight years – Schoolhouse in the Wind, Cornish Years, and A Stranger in the Midlands – and it runs from her earliest memories to a day in her late 50s when she went to America to visit her brother. 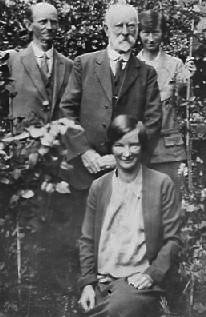 From her father’s village school she went to St Austell County School, then to a teacher training college in Truro and then taught in various schools in Cornwall. 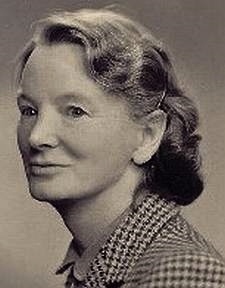 Ambitious to read deeper and wider she took an external course at London University during the First World War, later spent a year at Liverpool University, later still took a postgraduate degree at Oxford as a mature student. Her longest spell at any one school was a seventeen-year stint at King Edward’s in Birmingham, ending in 1946 with a year’s sabbatical leave. She had by then already written Schoolhouse in the Wind two years earlier, and her future was to be a writer, exiled but coming to her beloved Cornwall when she could. In those twenty post-war years she lived mostly in Devon. She was never married and died in 1966. One reason why her life seems so tranquil is that she was so eccentric, and at the same time so commonsensical that she records what she did as if doing it were the most obvious thing. For example, she loved air with a passion. It is a word of power in her books, her poems especially; there it is, in slight disguise, in the title of Schoolhouse in the Wind. Hence her whizzing about the country in her young days on a Velocette motorbike, the air streaming past her nose like high-speed champagne. As a teacher in Birmingham she spent a summer term commuting (by Velocette) from a tent in Shropshire on Clent Hill. Tents also feature in later summer holidays in Gorran with her sister Susan – three tents, one for each of them and one for the saucepans… Her outdoorsness gave her the keenest eye for the particularity of place, and she could see several worlds in a single Cornish parish. “Art concealing graft”… what an intriguing comment that one is, as well! So, if you stumble upon anything by Anne Treneer in your travels, pick it up and peruse it. She has a lot – happily wry and generally unsentimental – to say. This one gets a “hidden gem” tag.